Not too long ago, it felt like you would never hear “marketing” and “technology” in the same conversation. But it’s become apparent that marketing technology and operations are now the backbone of modern marketing. Nothing illustrates this evolution more than The Marketing Technology Landscape Supergraphic, a visual organization of vendors in the marketing technology space across different categories. Digital Asset Management, CRM, Collaboration, Mobile Marketing, Projects & Workflows, Video Marketing – the categories go on. Created by Scott Brinker of ChiefMarTec.com fame (with help from Anand Thaker on the data side and Jeff Eckman on the visualization), the supergraphic grew simply out of Brinker’s fascination with the collision of technology and marketing and the impact it was having on marketing. ‘It’s meant for a pretty broad audience: basically anyone who has a stake in understanding how marketing is changing. It’s just one facet of how marketing is changing, but it’s a very interesting one. It has a lot of ripple effects,” Brinker recently said in an interview with Velocity Partners. This year’s graphic was released in April and highlights the now 6829(!) vendors in the marketing stack, a long way from 2011 when there were only 150 vendors. It’s hard to imagine that in only 7 years, the number of marketing technology vendors has grown that much. But there is no question that marketing has become a data-driven department. So now the hard question: what tools should you use? Marketers need to work technology into their overall strategies and decide which solutions will fulfill their mission. Is your organization leveraging content marketing to drive SEO? Is your goal to just get your data and assets in order? Will social media be your focus? 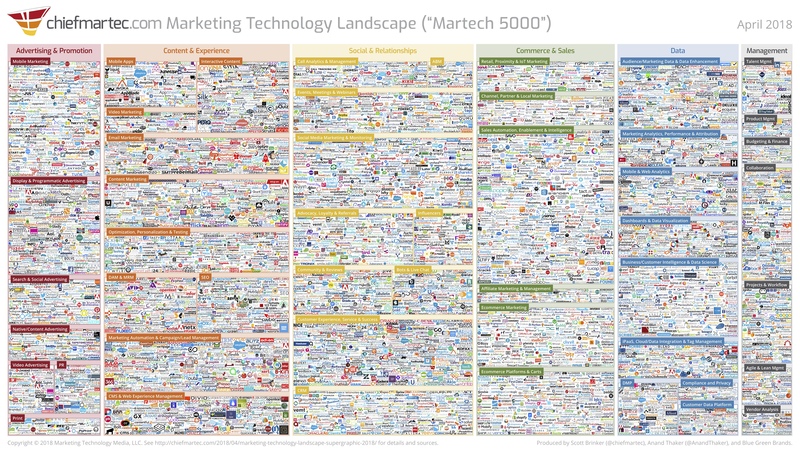 Luckily, based on the growth of this supergraphic, marketers definitely have more choice than ever: The Marketing Technology Landscape.